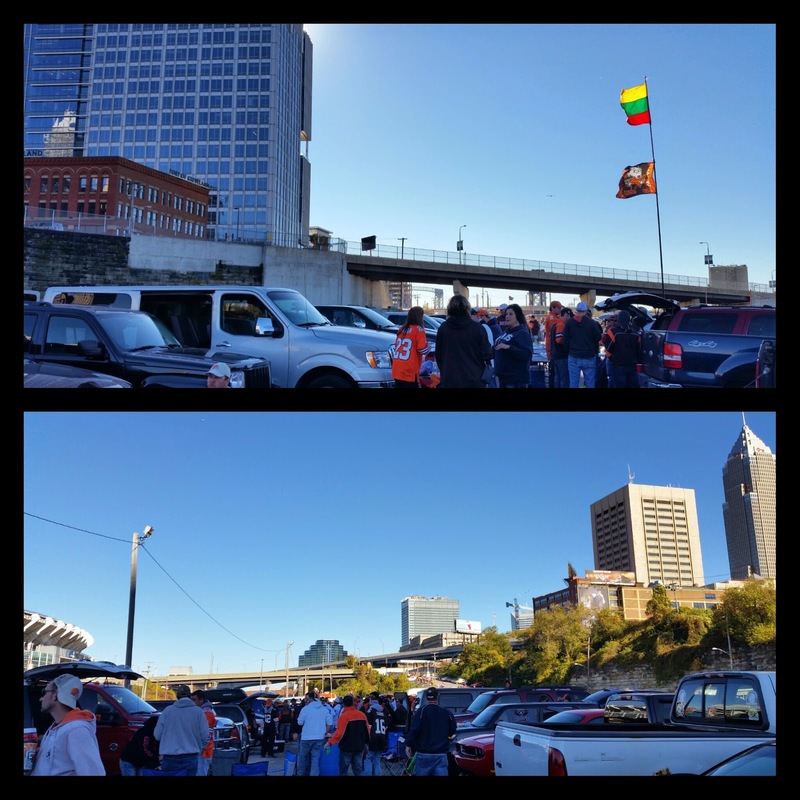 I’m happy to announce that I finally experienced my first tailgating. Yesterday was a gorgeous day filled with great food, friends, family and fun. Really, why did it take me this long?!? 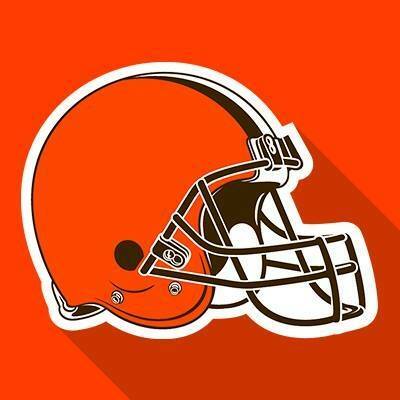 My brother-in-law has season tickets and tailgates every weekend. Since he goes with a group of his 20 something friends, their coolers are normally stocked with beer instead of food. But he came up with the great idea to host a clam bake. It was just the excuse I needed to finally take the plunge. With a forecast of 50° I layered up, threw an extra jacket and hat in the car and was ready to go. We picked up some donuts, coffee and snacks and were on our way. Destination: The Pit. It sounds kind of ominous doesn’t it? I always hear about the crazy tailgating that goes on so I was curious to find out for myself. We set up by the railroad tracks and had a great view of the stadium and the city. It was fun watching the trains and Rapid go by and I think the conductors got a kick out of seeing all the action as they drove past. *Pro Tip: Buy an extra parking space if you have a big group. That way you can spread out and have room for equipment, tables, etc. 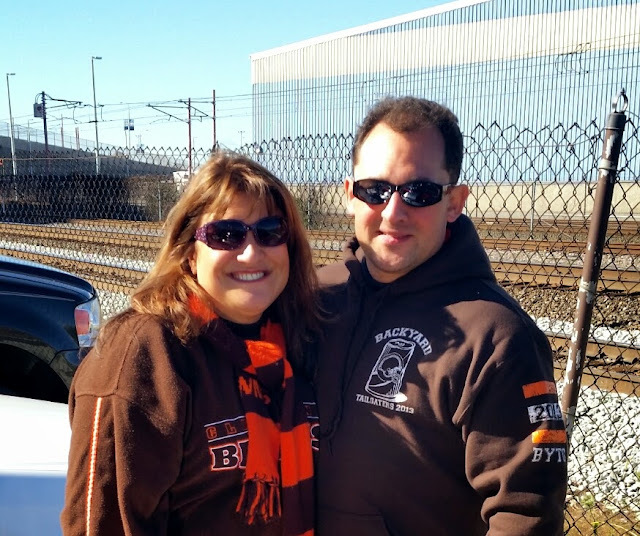 law got the bakes from Heinen’s – they were only $15 per person and were great quality. We each got 1⁄2 of a chicken, a dozen clams, an ear of corn, coleslaw, a giant sweet potato, a roll, butter, and a fancy place setting that included a giant napkin. What a feast! Prep and Pack: Do your prep work at home. (Clean the potatoes, shuck the corn, etc.) Don’t forget real butter and a small aluminum disposable pan to melt it in for the clams, BBQ sauce for the chicken, salt & pepper, hot dogs, buns and any other seasonings/condiments you’ll need. Steam: Pre-fill the steamer at home. Don’t forget to add the water before you leave or be sure to bring it with you. Accessories: You’ll need tongs, BBQ mop, grill scraper, foil etc. Grill: After the chicken is cooked, slather on some BBQ sauce and grill it. It’s worth the extra effort, plus you can make some hot dogs for appetizers while you’re waiting for the clambake to cook. Clean up: Don’t forget garbage bags, a recycling bag for all your "soda" cans and bottles, paper towels and most importantly, baby wipes. 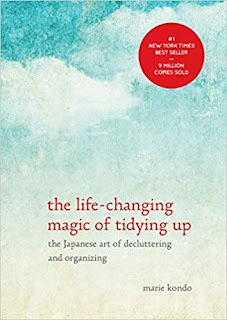 Those are perfect for cleaning up sticky hands, wiping off the table, as a TP substitute and so on. 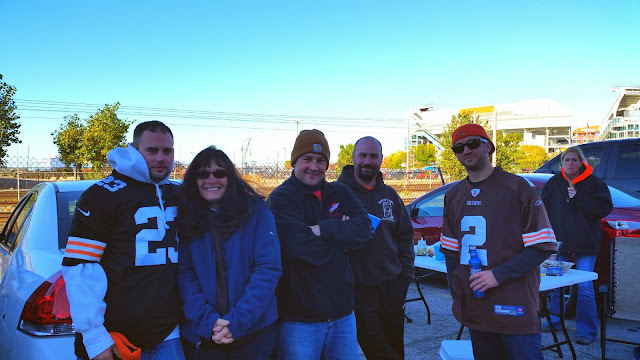 I absolutely loved tailgating! Everyone was super friendly and having a great time but we didn’t see anything too crazy. And the Browns even did their part and brought home a win. I loved walking around and seeing everyone’s food, how they were set up, what they were wearing and all the crazy decorated vehicles. 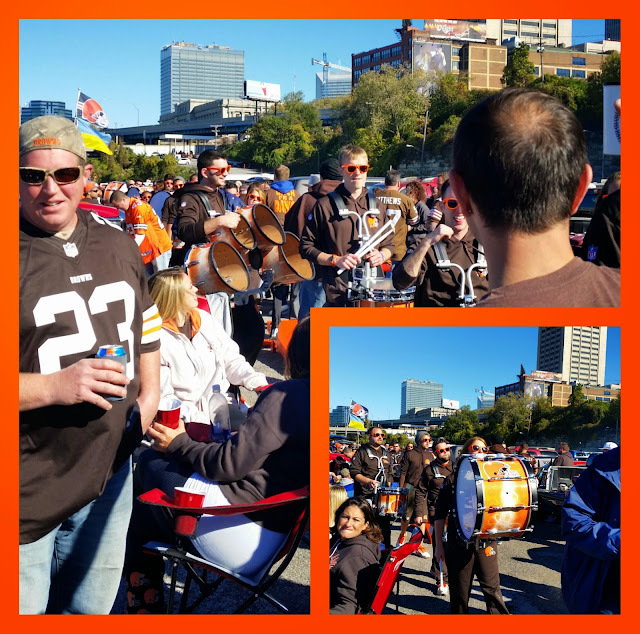 The Browns Drumline even made an appearance. 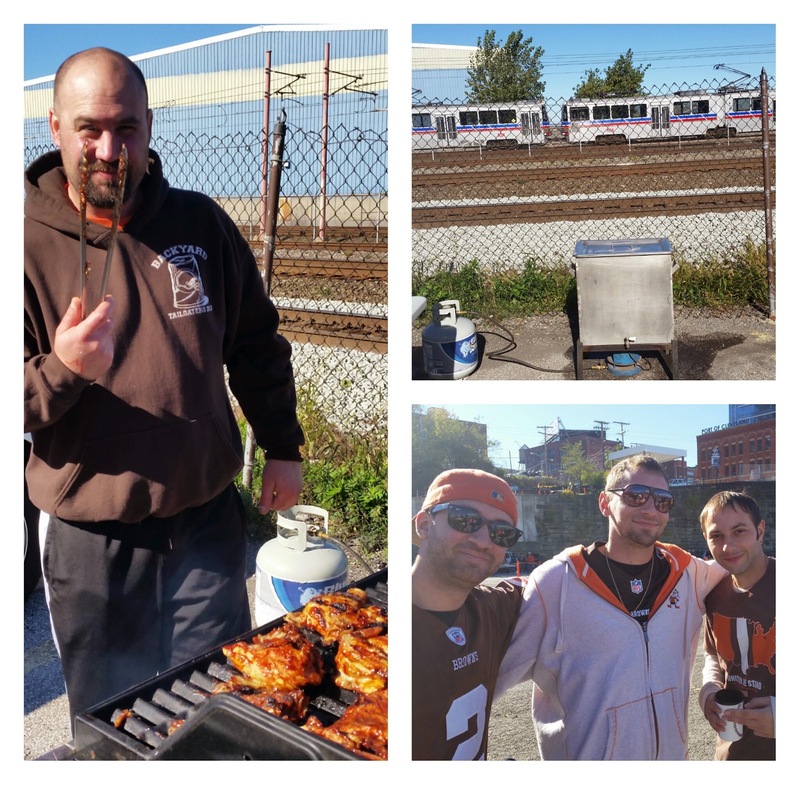 This was my first tailgating experience, but certainly not my last! I’m a wimp so I’ll need to act fast to go again this season. What’s your favorite place to tailgate? And what kind of feasts do you make? Recently I received a spaghetti squash in my Fresh Fork bag. I'm crazy about all kinds of squash but I've always shunned spaghetti squash. I think I got turned off when people started spooning spaghetti sauce on top and claiming it was just like pasta. Um, yeah, in your dreams! It's never been one of my favorite squashes because of its mild (bland!) flavor and the stringy texture that gives it its name. But I'm not one to give up on a veggie so easily and I hate to waste food. So to the Internet I turned. 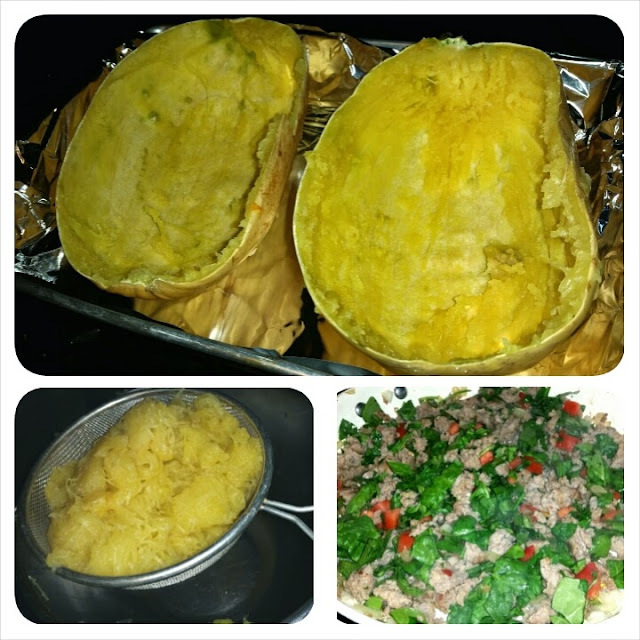 My friend Bite Buff featured a delicious sounding recipe for chicken enchilada stuffed spaghetti squash on her blog. But making it would have entailed a trip to the grocery store. I finally settled on a recipe from Epicurious for inspiration because I had all the ingredients and I liked the idea of all the ingredients being mixed together instead of the dish trying to pose as pasta. The squash, pepper, tomato, and sausage are from Fresh Fork so if you have trouble figuring out how to use up everything from your bag, this recipe is for you. Our marinara and cheese were from Alesci's and were leftover from making pepperoni bread. It was a huge hit! Super easy, quick to fix and crazy good. It's a keeper for sure. I've officially added spaghetti squash my yum list. First cut your squash in half lengthwise to make two "boats." Remove seeds. You can roast them like pumpkin seeds, toss them outside for the squirrels, compost them or throw away. Sprinkle the cuts sides with salt. Place cut side down in a baking dish. Add about a 1/2" of water. Bake at 400 until tender. The timing will depend on the size of your squash. Mine took about 40 minutes. If you prefer, you can zap them in the microwave until tender too. While the squash is baking, cook sausage in a non-stick skillet. If it's fatty, drain. Chop and add: pepper flakes, bell pepper and onion. Cook until tender. Add spinach and tomato and stir until spinach is wilted. After the squash is soft, let cool long enough so you can handle them. Use a fork and scrape out the flesh into a colander. (Be sure to keep the squash halves intact.) You want to drain the cooked squash to remove excess liquid and keep your dish from being soggy. Remove skillet from heat. Stir in marinara sauce and salt/pepper to taste. Place mixture into reserved squash shells. Bake at 400 for 20 minutes. Remove from oven and sprinkle with shredded cheese. Return to oven until cheese is golden brown. That's it! Told you it was easy. And wait 'til you taste it - yum! One of the best things about this recipe is that you really don't have to measure and it's flexible enough so you can use up other veggies (kale, mushrooms, zucchini, etc) and experiment with the meat. I think it would be really good with chorizo or a chicken sausage too. What's your favorite spaghetti squash recipe? Do any of you remember going to the old Capers in Beachwood? Well, you wouldn't be able to recognize it these days. Thanks to some major renovations, both in style and substance, it's been transformed into a hotel restaurant that even the locals will want to frequent. 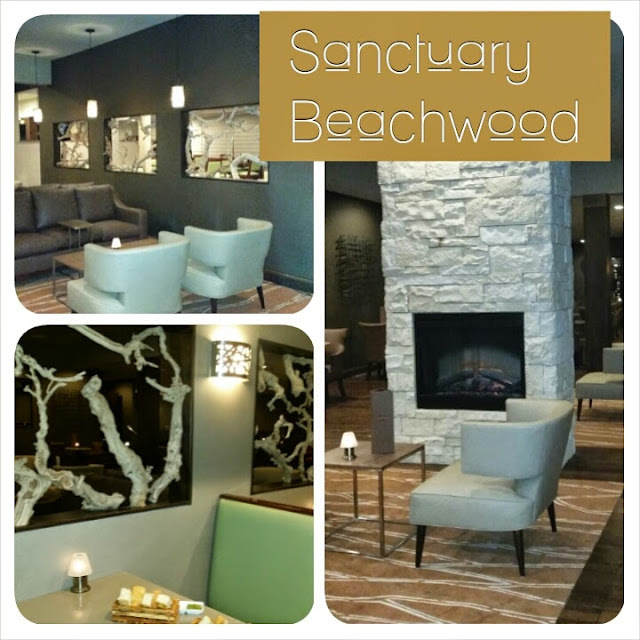 Thanks to Sanctuary, The Doubletree by Hilton now offers a gorgeous and delicious dining option on the East Side. I recently was invited to a media preview to the changes firsthand. 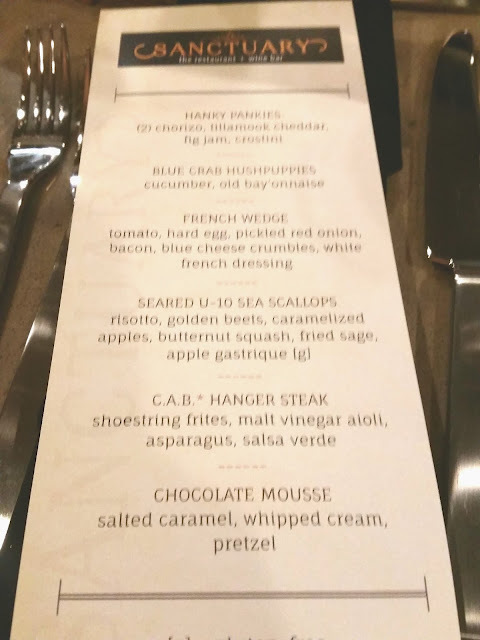 The menu for the evening was a nice sampling of what the restaurant has to offer. We started out with a beehive cocktail (bourbon, St. Germaine, honey and lemon) and a spicy version of a classic hanky panky. The cocktail party classic was updated with chorizo and a dab of fig jam. 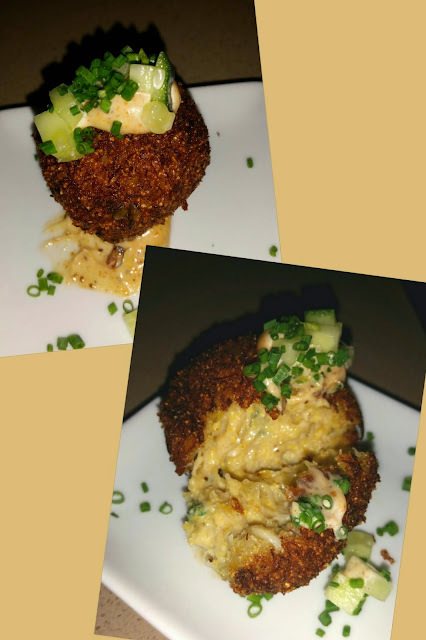 Next up was my favorite course of the night: a blue crab hush puppy. 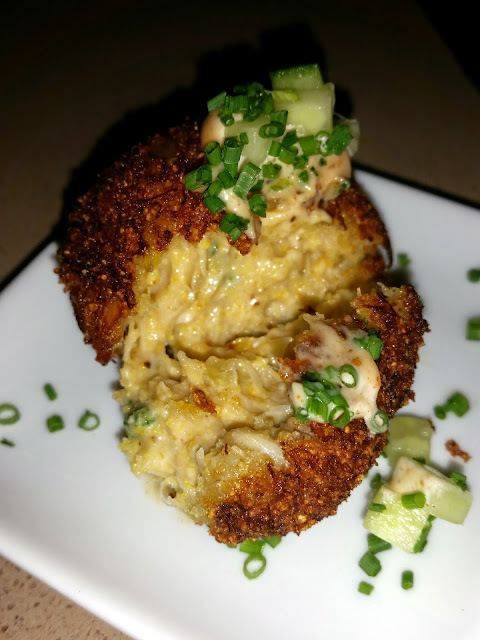 Crispy on the outside and creamy on the inside with a hint of crunch from fresh cucumber, I could have gobbled up a tray of these tasty bites. If these are on the regular menu, order them! 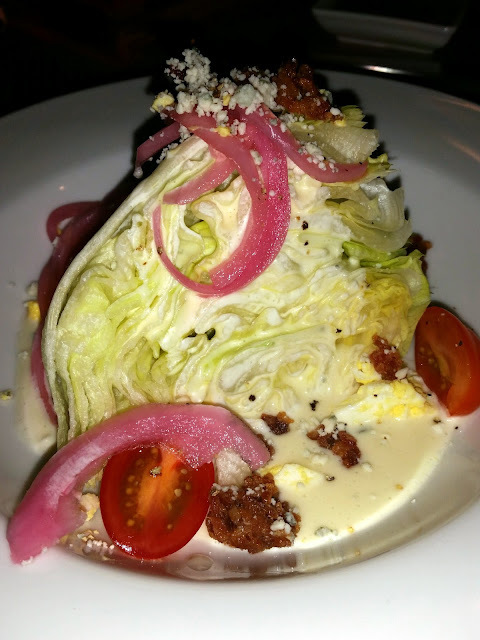 A wedge salad included blue cheese crumbles, pickled onion, grape tomatoes and bacon drizzled with a really delicious white french dressing. The dressing was unique and complimented the salad well. The next course was one that had the whole table talking: seared scallops served on top of risotto studded with golden beets, butternut squash and caramelized apples. 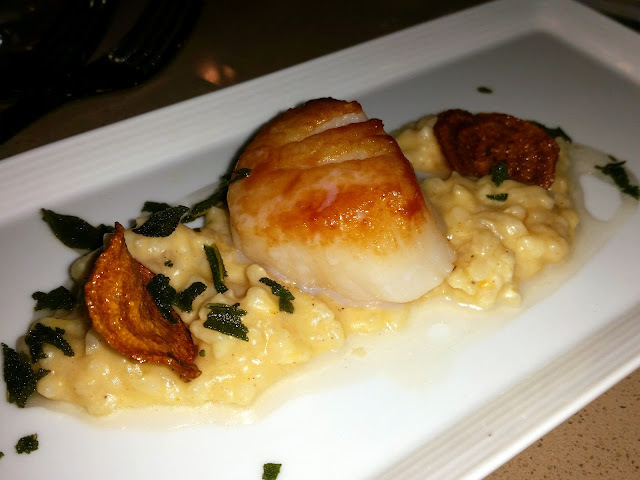 We all agreed that the scallop was perfectly cooked but couldn't pinpoint why we didn't love the risotto. Too sweet? Odd spices? Needed more chunks of veggies? 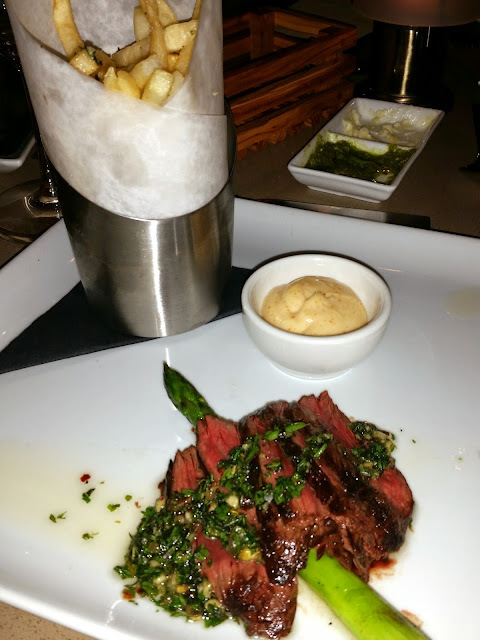 We were happy to see a hanger steak being served since we all agreed that the version at Hodges is one of our favorite preparations. This salsa verde was a little too salty but the steak had a great sear and was very tender. And even for a multi-course meal, one stalk of asparagus does not equal a serving. Hopefully these will be adjusted for their regular dining service. But the herbed fries and delicious malt vinegar aioli were plentiful and hot. I think I literally squealed when the dessert was served. 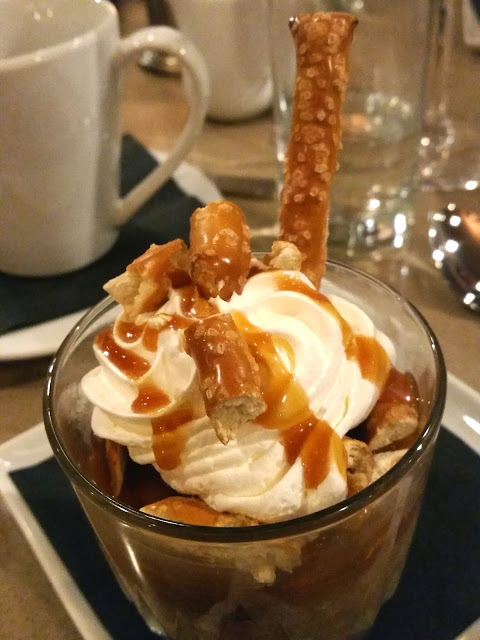 Rich chocolate mousse and chunks of pretzel rods were topped with whipped cream and salted caramel. There was some serious yum in this dish and even after a full meal, there were empty glasses all around. The servers were all very nice and did a great job. My only real disappointment was not being served wine. A wine glass was on the table all evening and I kept hoping that some wine would arrive. Such a tease!! Sanctuary is a restaurant and wine bar after all and it would have been nice to see what the wine list had to offer. I definitely intend to go back to find out. And get some more of those hush puppies! 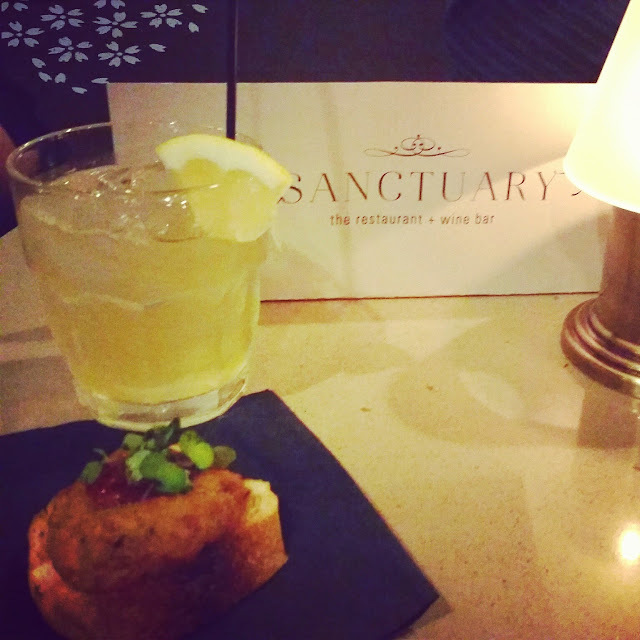 The Sanctuary website contains their full menus and you can follow them on Twitter and on Facebook. Stay tuned for another Sanctuary opening in Westlake late next year. I wish I could keep this place to myself but the secret's out. Merwin's Wharf is my new favorite spot with a view in CLE. 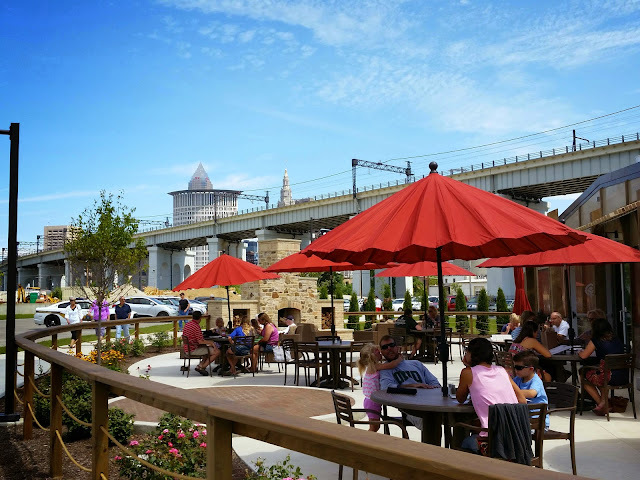 The Cleveland Metroparks did a fabulous job designing both the interior and exterior of this river front gem. Garage doors open onto a wrap around patio that includes a wood burning fire pit and a gas fireplace, tons of tables and comfy couches. Rowers, freighters, kayaks and other boats provide regular entertainment as they pass by. The food: My husband and I both had the sockeye salmon special and our friends both had the fried perch dinner. Everyone was very happy with our selections and the prices were good. The beer selection is decent - I think we are spoiled because so many places have a huge craft beer list these days. The service: We sat at the bar while we waiting for our table and the bartender was great. For dinner, our waitress was prompt, helpful and pleasant. The only SUPER annoying thing about this place is the they refuse to take same day reservations. Really. When I called twice to clarify this unreasonable rule, I was given some sort of nonsense without any real explanation of why this is their policy. If tables are available, why don't they take a reservation? We had out of town company and 14 of us wanted to eat here but without a reservation there was no way we were taking a chance and having to wait 2 hours for a table. 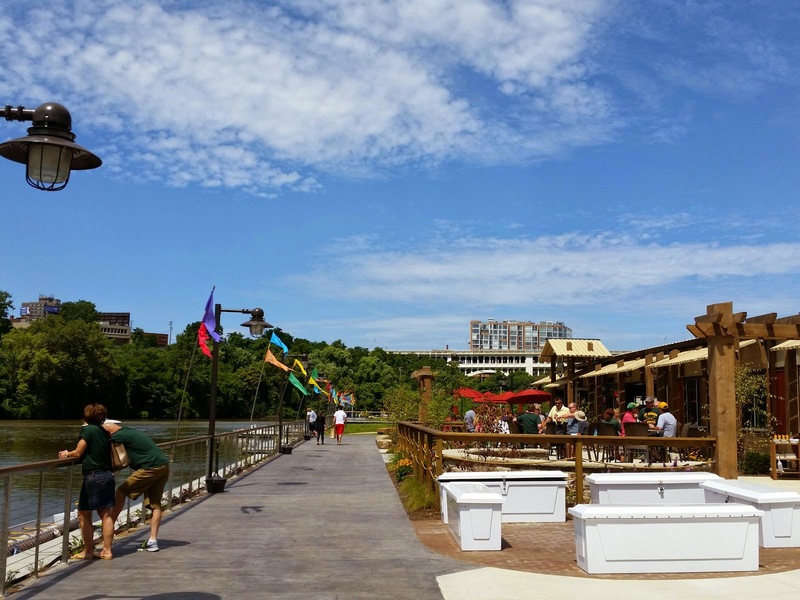 I know that the Metroparks aren't used to running a restaurant but common sense should tell them that if they have open tables and people want to sit at them, they should do what every other normal restaurant does. Other than that one gripe, we can't complain. The fabulous fire pit and fireplace make summer ending a little easier too. Tuesday through Thursday - 3-10 p.m.